Before I start to talk about one of my favourites characters of Anne Boleyn’s time I want you, dear reader, to take a moment and join me in a deep and emotional travel. Imagine yourself living in the XVI century. You live in England. Imagine you are a 20 years old girl. Your family is a good family, your dad has a fine job. He knows important people. Your uncle is also an important man. But, even being in a good family, you don’t have much to expect of the future besides getting married with a good man and live a life as a normal woman, taking care of your kids and husband. Imagine that life can be greater, that just a husband, a house and kids won’t make you complete. You want more! You lived in France, one of the most glamourous courts in your time. You met important people. You saw most the beautiful jewelry in the whole world, you ate great food, you danced and flirted. You were friends with Marguerite d’Angoulême, a woman ten years older, that happens to be the sparkling sister of Francis I. Your father just made you came back to England. He says that he might had found you a husband, Lord Butler. You know why your dad wants this marriage to happen. Your dad wants the land that once were his grandfather’s, Lord Ormonde. His mom didn’t have the right to have it because she was a woman, so her ‘cousin’ got it, Sir Piers Butler. Now, your dad wants those lands and one of the ways of getting it back is by marring you to Sir Piers’ son, James. Your dad is not so sure about it just yet, he wants the lands for himself, not for you. This guy, James Butler, has the same age as you, he lives in the court and this marriage seems to be a quite good solution. Anyway, the King needs to give his opinion about it first. While the marriage arrangements happen you are going to work in the court, with the Queen herself, Queen Katherine. Your first appearence in the court takes place in a play on March 1st, 1522. You play ‘Perseverance’, wich suits you well. People like you in the court, you are a good company and people also say that your eyes, even thought they are brown, are charming and expressives. One day, you met a fine young man. He is always visiting the Queen. He is from a great family, his is a english nobleman, Wosley’s page, the eldest son of Henry Percy, 5th Earl of Northumberland. His name is also Henry Percy and he is about to change your life: he falls in love with you! Yeah, he loves you and you love him back! This young, handsome and important man doesn’t care if, in the eyes of the society, you are not good enough for him. He doesn’t care if there is a marrige being arranged for you and he doesn’t care if his dad has plans for him to marry Mary Talbot. He wants to be with you, he wants you to be his wife and he tells you that. You are betrothed to Henry Percy! How lucky you are! But as life is not always good, things starts to fall apart. Wosley knows about you and Percy and he can not let it happen. Henry needs to marry Mary and you… you need to wait and see what’s going happen to you. Wosley calls Henry! You trust him, you know that he will fight for you. He does, until his father is called. The 5th Earl of Norhtumberland and Wosley, both important men, talk to Henry. Your charming member of the Council of the North and future 6th Earl of Northumberland to be, gives up on you! He breaks your heart! He leaves you because Wosley and his father want it. Maybe he didn’t love you that much. Maybe he was lying. Maybe other things in his life are more important than you. You, the one whom decided to gives everything to him. Now, dear reader, you can come back to reality and begin to wonder what I’ve been wondering for so long: How important was Henry Percy in Anne’s life? Did Henry make Anne become what she was? Was Anne’s thirst for power a result of this broken heart? Did it ever cross her mind that she needed to prove everyone, specially Wosley, that she was worthy? As Eric Ives notes, there are reasons as to why Wolsey, of his own accord, separated the couple. Wolsey had worked towards an union between the Percy family and the Talbots and therefore, was involved in the marriage negotiations between Percy and Mary. Had the relationship between Anne and Percy been serious to the degree that they wished or had actually become betrothed then this was a direct threat and challenge to his plans? Therefore it is easy to acknowledge how Wolsey could become annoyed with the pair in his own right and given both a sharp rebuke. As a woman I know how dangerous it can be to have a broken heart. Some things crosses our minds, and after all the crying we might need some revenge! I’m not suggesting that Anne lived for this, as we all know that life goes on and you find someone new. She found the King! What I’m saying is: Did it made Anne stronger? Would she be able to do the things that she did if her heart had not been broken? She was strong, she was forward, she was incredible, that’s a fact! But didn’t this sad situation worked as a gas and made Anne go further and stronger that she could ever imagine? What we know about Henry Percy in not much. There is some debate in regards to when Percy married Mary Talbot. David Starkey affirms a date around 1525. But the entry on Henry Percy at Oxford DNB notes that he married Mary sometime between January to February 1524. 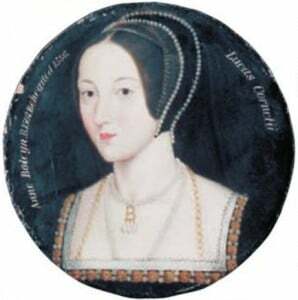 Eric Ives in his work on Anne Boleyn also notes that arrangements for the match were finalised in 1523 indicating that the following year the marriage was to be set. The date really doesn’t matter, because – as predictable – Henry and Mary were an unhappy couple. They didn’t get along, what made her returned to her father, and hated her husband for the rest of his short life. Mary later sought a divorce. In 1532 Mary accused him of a precontract with Anne. Percy, by this time the 6th Earl of Northumberland, denied the accusation on oath. It failed, there was no conclusive proof. Henry and Mary didn’t have children. Even though Henry was a important men in England, serving the King many times – including arresting Wosley and signing the letter to the Pope in July 1530 asking that the divorce might be hurried on – he was not often allowed to go to court, nor even to his father’s funeral. Henry also formed one of the jury for the trial of Anne Boleyn in May 1536, which probably hurt her once again. Imagine to be judged by people you know, by your uncle and by the man who once broke your heart. By this time, Henry was ill. Is said that he collapsed following the verdict and had to be carried out. He died on June 29th of 1537, just a year after Anne’s death, and was buried in Hackney Church. Was he still in love with Anne when he died? Did he regret what he did? What would be different in England if Henry Percy had married Anne? What would have happened if he and Anne have never met? This men is a important part of Anne Boleyn’s life. He is an important part of England’s history. He was the 6th Earl of Northumberland, a member of the Council of the North, Warden of the east and west marches, Lord President of the Council of the North, Knight of the Garter, the High Sheriff of Northumberland and, probably a heart-breaker for a life time. Based on Cavendish’s story, Percy was terrified of his father and heartbroken when he was forced to separate from Anne. The real heartbreaker was probably the King, if he was (as some believe) the one behind the separation for his own purpose.